Though it is definitely not a favorite topic to talk about, your poop definitely deserves your attention. Your poop and bowel movements can reveal a lot of important information about your overall health, especially when you are not regular. Namely, constipation is a common concern for a lot of people today and it can be a result of numerous factors, including low fluid intake and unhealthy diet or the presence of some bacteria or emotional imbalance. This being said, you definitely need to check out your poop from time to time and learn what it “tells” you about your health. Continue reading the article to learn more. Before we go on to present the Bristol Stool Chart, we should mention a couple of important facts about poop, also known as feces or stool. Namely, it comes in different colors, smells, and shapes and a healthy poop requires minimal strain and no pain. The passing of stool should not take more than 10 to 15 minutes- if you need longer, you may have a health problem like constipation, hemorrhoids or some other complication. If you have noticed blood in your stool, it is important to consult your physician. 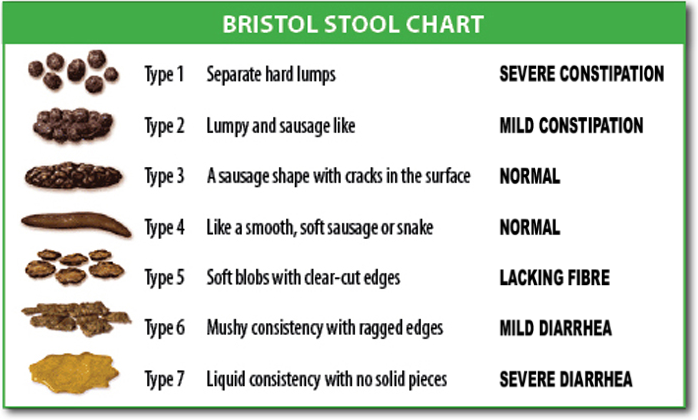 According to the Bristol Stool Chart, which you can see below, there are 7 distinct types of poop and meanings.